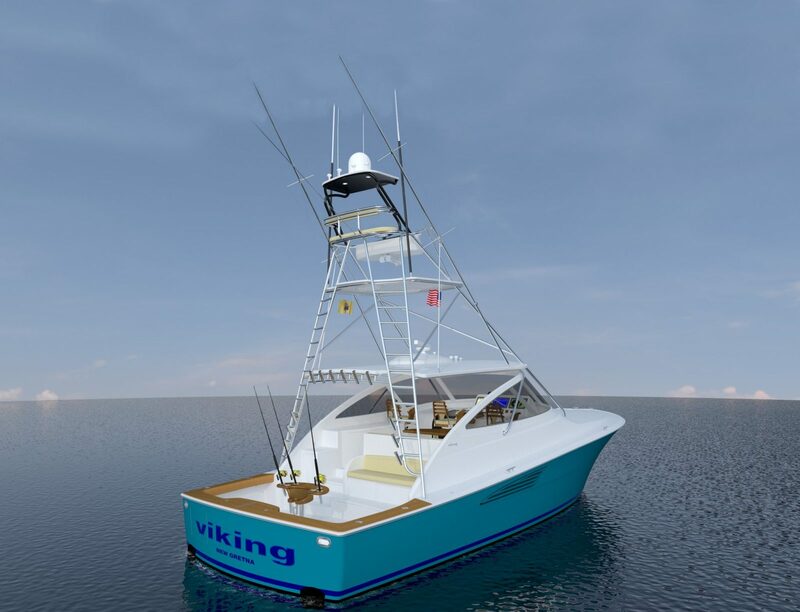 Viking’s reputation for building high performance express models maintains its enviable industry leadership with the announcement of the newest entry, the 44 Open. By their design, express boats cater to the owner/operator who enjoys his time aboard with family and friends and is content to fish hard on Saturdays and yet be equally accommodating when the family prefers to take to the water for a relaxing cruise. 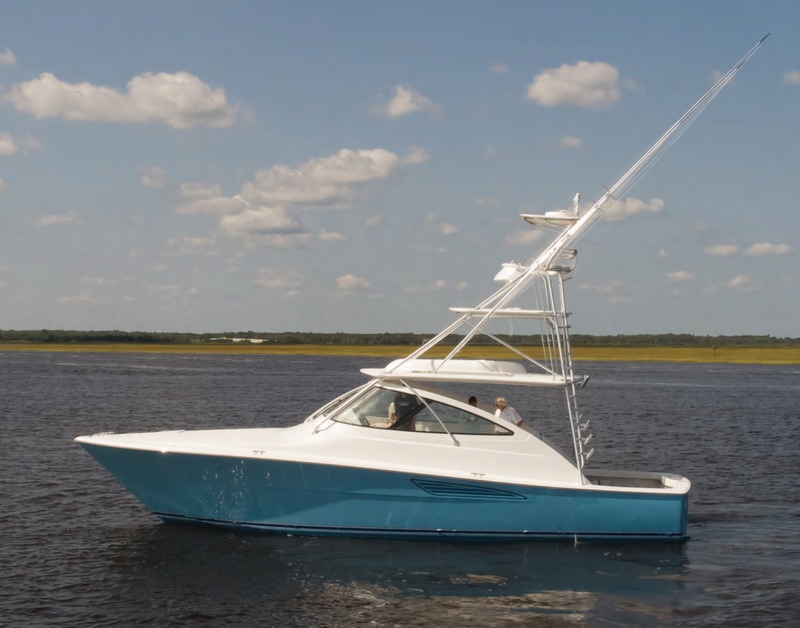 Whatever the game, the new Viking 44 scores points handily and is ready to rack up nautical miles while delivering fishability, accommodations, handling and performance. 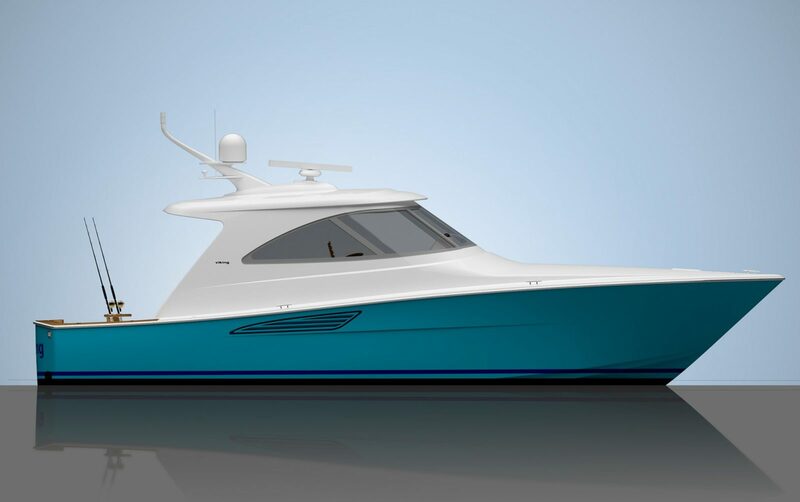 The Viking 44 Open is a fresh design with a resin infused composite hull and a matrix of fiberglass encapsulated stringers, vacuum bagged cored main and intermediate bulkheads, a customized E-glass lamination schedule and infused fuel and water tanks. An aggressive entry with over six feet of freeboard forward rakes over head seas and its sheer line proudly carries aft with an eye pleasing profile. The running surface is equally adept with 13.9 degree transom deadrise, and two pairs of lift strakes providing lateral response and tracking confidence in any seaway. 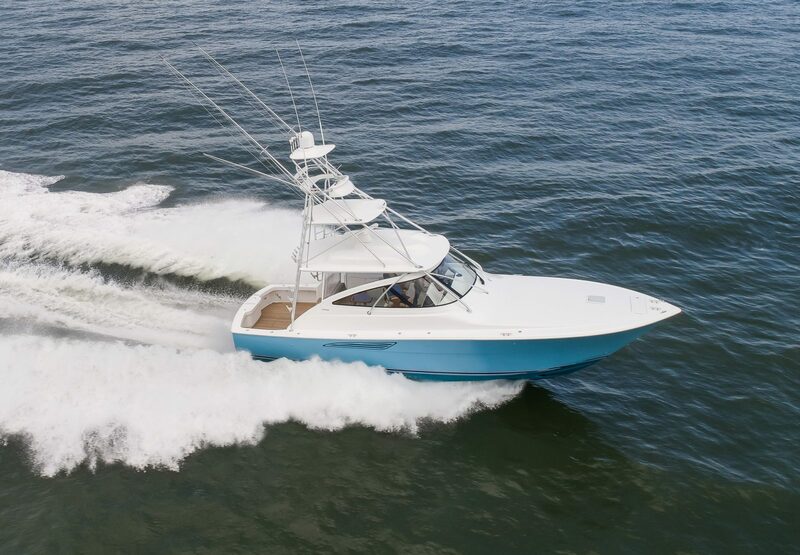 The command bridge of the 44 Open shares many of the practical and notable aspects of its larger siblings including our signature and tournament proven centerline helm station on a raised platform for enhanced visibility through the one-piece molded fiberglass wraparound windshield. A Costa Clear side enclosure provides all weather protection, as well as touch screen climate control when the command deck is air conditioned, a popular option. The helm pod available in molded fiberglass or teak and is equipped with single lever electronic engine controls, a polished stainless-steel wheel, and power assisted hydraulic steering. A raised molded fiberglass console complements the helm with room for a bank of three 17-inch monitors for navigation electronics, along with space for engine instrumentation and other accessories. Recessed compartments accommodate radios and additional equipment, plus accessory switches and controls. Like all Viking yachts, the 44 Open can be appointed with custom Atlantic Marine Electronics’ packages for navigation, communication and entertainment accessories, and using this Viking subsidiary allows the yacht to be delivered turnkey ready. The spacious command deck with a molded nonslip fiberglass sole affords generous seating options including three adjustable pedestal seats with foot rests. A four-place L-shape lounge with a dinette table is to starboard. 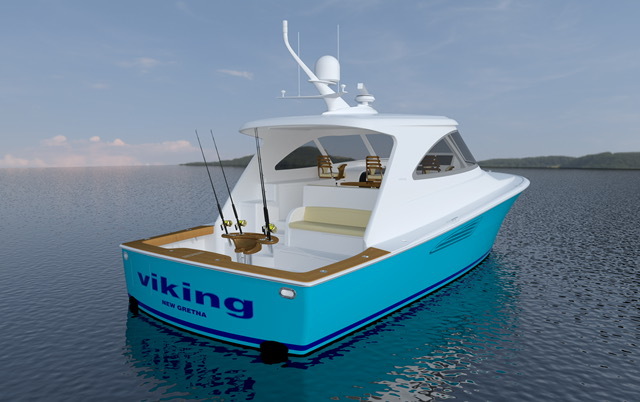 As you would expect from Viking’s commitment to build a better boat every day, the lounge backrest lifts to expose a convenient fishing rod stowage area. To port, a large integral console houses refrigeration with an ice maker and generous stowage compartments. Overhead rod stowage and a teaser reel compartment are available in the molded fiberglass hardtop. 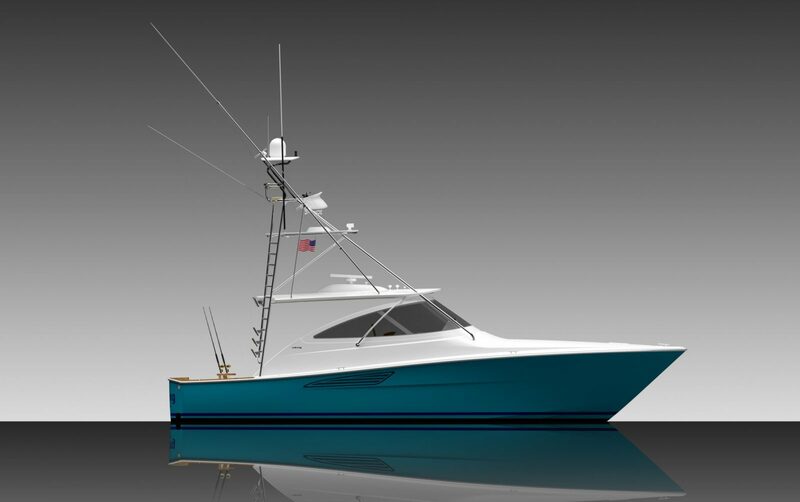 Outfitted with a custom designed and built Palm Beach Towers’ tuna tower, another of Viking’s experienced subsidiaries, the 44 Open comes ready to fish with a second complete helm with additional electronics, a fiberglass buggy top and Rupp outriggers. The tower is a valuable addition both for fishing and for reading the shallows when negotiating Bahamian waters. A sliding door and a sturdy staircase with stowage and a concealed central vacuum system lead to the salon affording numerous comfort treatments. With its 16 ft. 4 in. 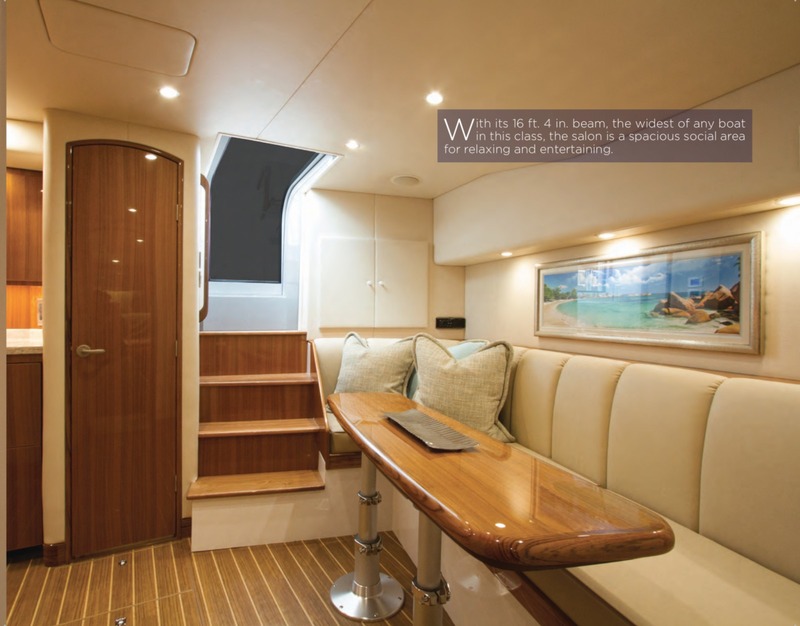 beam, the widest of any boat in this class, the salon is particularly noteworthy by taking full advantage of the square footage fostering a prime social area for relaxing and entertaining. Nicely appointed with professional designer touches and furnishings, the salon features custom Amtico flooring, a 28 inch flat screen television and a multi-directional stereo system. Viking’s craftsmanship abounds and the large L-shape lounge creates an inviting atmosphere with a convertible dinette that serves double duty as a meal center with additional sleeping accommodations. 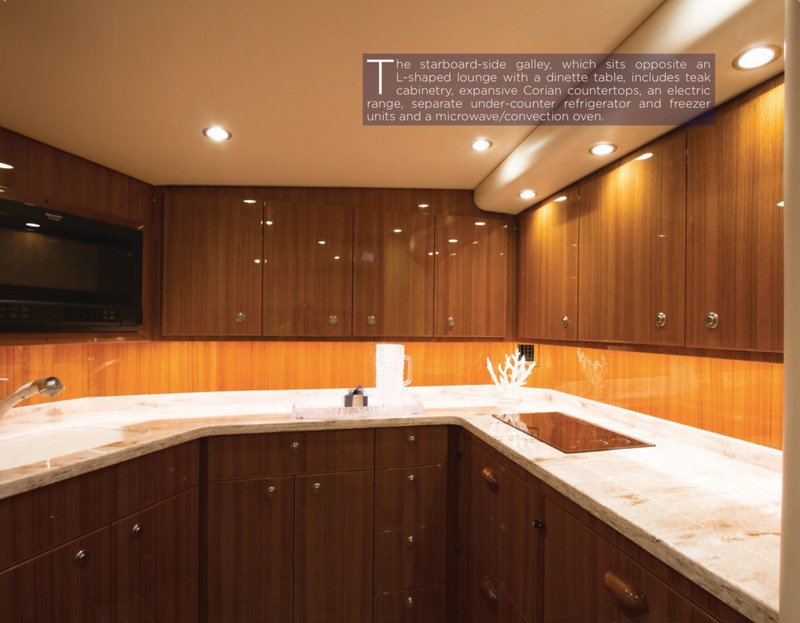 A well-equipped galley includes Corian countertops with a recessed sink and an electric surface mounted cooktop. A microwave/convection oven and drawer-style under counter refrigeration, as well as abundant cabinetry maximizes stowage capacities for supplies, dinner and cookware. Privacy is enhanced by separating the sleeping accommodations between the salon and galley with the master stateroom forward and a second stateroom aft. In the master, there is a walk-around queen bed with an innerspring mattress with plenty of stowage underneath. Fine joinery lines the hull sides with stowage options and a maple-lined hanging locker. Air conditioning, a 22 inch flat screen television, a Bomar hatch, carpeting, and private access to the head and shower are among standard amenities. 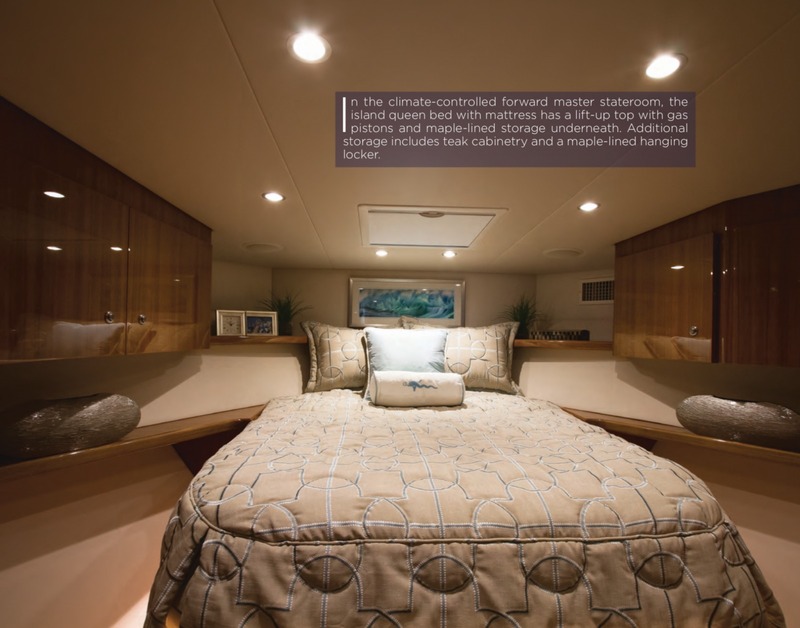 The aft stateroom on the port side features a queen bed, a maple lined hanging locker, reading lights, carpeting, and plenty of stowage. The 119 square foot cockpit just steps away from the command bridge deck is tournament ready with flush rod holders, fresh and salt water wash down systems, a transom live well, and a transom door with a lift gate. Under gunwale features include LED rope lighting, wash down spigots, gaff and tag stick stowage, a freshwater fill, and a quick disconnect fitting to the oil exchange system for the engines, transmissions and the 13.5 Cummins Onan generator. The Viking 44 Open features a conventional drive system utilizing of a pair of MAN I6 800 CRM diesels, which develop 800 MHP each. Matched to a set of high performance Veem propellers, the 44 Open will cruise at 2100 rpm at 33 knots with a top end around 37.3 knots depending upon load, sea conditions, and other environmental factors. This document is not contractual. All specifications are given in good faith and offered for informational purposes only. AqvaLuxe does not warrant or assume any legal liability or responsibility for the accuracy, completeness, or usefulness of any information and/or images displayed. Yacht inventory, specifications and charter prices are subject to change without prior notice. None of the text and/or images used in this brochure may be reproduced without written consent from the publisher. Thanks for your interest in 44 Open. Please fill in the form below to send us a message and we'll be in touch soon. Or you can call us on +377 9770 3136 and we'll be very happy to talk with you. Hello AqvaLuxe, I am interested in chartering or buying one of your yachts. Please contact me to discuss further. Thanks. Website & content copyright © 2019, AqvaLuxe Group SARL.